Take off, it's a beauty way to go. We had a great week in Minnesota. It always starts with a 12 hour drive, which is kind of a pain in the rear, literally. Visiting our son, other family and friends, and Thanksgiving, is the motivation for the trip. But I will hit on some of the other highlights here. Jessica and I drove to Duluth, to visit our best ever neighbors and go to some favorite haunts. On the way, we picked up a hitchhiker. He seemed nice enough, but Bill said he'd picked him up before and he didn't recommend it. Said he talked too much and you couldn't get a word in. He had nice hair, though. We did get to visit with Bill and Lois for awhile. Got to see Bill's computer, some really old post cards (which were way cool, by the way), and Lois gave us coffee, cinnamon rolls and, best of all, Lois hugs! 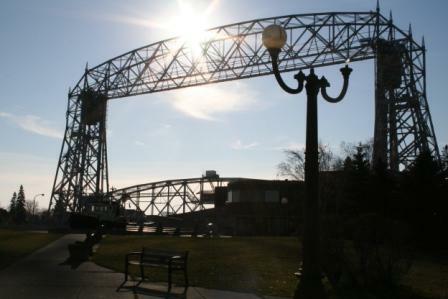 Then we went to Canal Park to take a gander at Lake Superior and the famous aerial lift bridge. From there, up to Gooseberry Falls, Split Rock Lighthouse and Pebble Beach, where we amused ourselves trying to skip stones and tossing ever larger rocks into the drink to see what kind of noise they would make. You can amuse yourself for quite awhile with rocks and water. 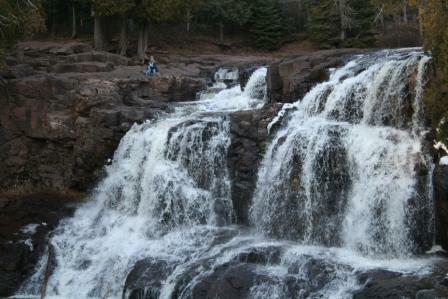 That's Jessica's teeny self on the rocks left of the falls. On the way back to The Cities, Jess wanted to stop at a casino. She is trying out "now that I'm 18" stuff. We got a couple of rolls of quarters, did slots and "machine" poker for about an hour, and came out with a few more dollars than when we went in, which we put into a Salvation Army pot at the grocery the next day. Thanksgiving was very special, a 50 year tradition that will be the subject of an upcoming post. After that, I got my son's cold and spent the next few days watching, as my daughter puts it, senseless television (okay, she's right, six hours of a "Faith and Hope" marathon is pretty stupid, but I had my tea and chicken noodle stuff and I just didn't care). Our last night, we ate some wonderful salmon that my FIL and nephew caught on their Alaskan cruise in August (and my MIL cooked to perfection). Yum-O. Then we got to drive 12 hours home, which is a pain in the rear. This evening, my daughter and her friends put up Christmas lights. And we were under a tornado warning. Later this week, we are supposedly in for a winter storm. Gotta love Oklahoma. It looks like you were nice to me. I'm quite sure Lois has MUCH worse pictures of me in her baskets of photos. But always with the hair. Why is it always about the hair? 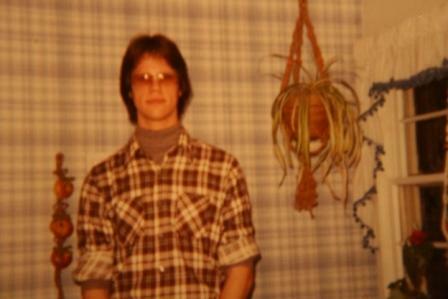 That hitchhiker sure looks like Jeff when he was a teenager!! [pretty funny Linda}. Nine years ago one of the Knights of Columbus suggested we do something more for the community. I said we should sell hot dogs and donate the money to the Shrine Hospitals. Now we sell in nine super markets during fishing opener and have donated $140,000.00 to that worthy cause. The honorary green fez is a very high compliment from the many friends in the Shrine. Yeah, the picture was Bill's idea (go figure), but I'm not sure if he or Lois pulled it out. She showed Jess some pics of you and Livingston Fury, complete with leather and funky hair. I don't know why, it just always ends up about the hair . . . but I think Elly is very sweet to grow some just for you. bill - thanks for explaining that. 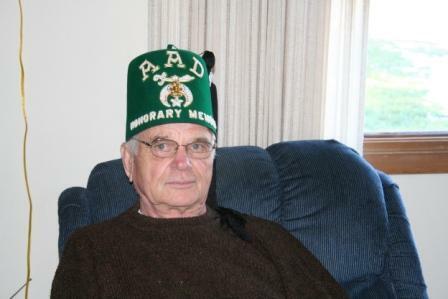 If anyone deserves the honorary green fez, it's you. That's a very cool thing that you are doing for kids. Funny, I just noticed I was wearing my camouflage shirt. It's amazing you can even see me against the wallpaper! h-man - yeah, the wallpaper threw me off. I was trying to figure out where this picture was even taken! Tell Jessica that I feel sorry over the break-up. I put her name on the bathroom wall in our local tavern so she might get a few calls to replace her boyfriend. It might have helped if I could list her income, and how she feels about men that do not want to make a commitment? bill - she was out of school today because we are in the middle of a blizzard, yeah, I know. Anyway, considering that she brought a really nice, cute guy over this afternoon, I'm thinkin' she's okay. But thanks anyway! With significant updates and visual enhancements, Visio 2010 Download delivers better experiences to simply be more productive and successfully complete all types of projects. Visio Standard 2010 Download offers the most advanced and efficient diagramming tools for managing IT, process, quality, and compliance scenarios. With intelligent, rule-based templates such as SharePoint Workflow, BPMN, and Six Sigma, driving consistency and accuracy across your organization is easier than ever. is a platform for viewing, creating, manipulating and managing files in Adobe's PDF format.